From this article we will go through network security as whole from basic to expert level. It will help you get better idea of Network Security. It’s just the reference for people who are interested in network security but don’t know from where to start there is more to do by own. Always remember that “Defense in Depth” is Key of NETWORK SECURITY. Basics of ISO/OSI and TCP/IP Model. 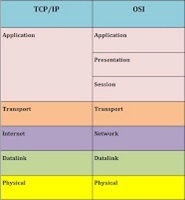 Know better Information Security OSI Model. Let’s begin with 1stpart to understand Basic of ISO/OSI and TCP/IP Model. What are reasons for layered model? Change:When changes are made to one layer, the impact on the other layers is minimized. If the model consists of a single, all-encompassing layer, any change affects the entire model. Design:A layered model defines each layer separately. As long as the interconnections between layers remain constant, protocol designers can specialize in one area (layer) without worrying about how any new implementations affect other layers. Transmission Control Protocol/Internet Protocol (TCP/IP) is a suite of protocol that governs the way data travel from one device to another. Each layer performs a specific function and is transparent to the layer above it and the layer below it. 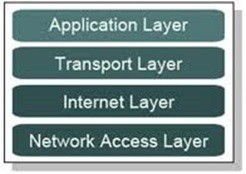 Application Layer: The Application Layer provides the user with the interface to communication. This could be your web browser, e-mail client (Outlook, Eudora or Thunderbird), or a file transfer client. The Application Layer is where your web browser, a telnet, ftp, e-mail or other client application runs. Basically, any application that rides on top of TCP and/or UDP that uses a pair of virtual network sockets and a pair of IP addresses. The Application Layer sends to, and receives data from, the Transport Layer. Transport Layer: The Transport Layer provides the means for the transport of data segments across the Internet Layer. The Transport Layer is concerned with end-to-end (host-to-host) communication. Transmission Control Protocol provides reliable, connection-oriented transport of data between two endpoints (sockets) on two computers that use Internet Protocol to communicate. User Datagram Protocol provides unreliable, connectionless transport of data between two endpoints (sockets) on two computers that use Internet Protocol to communicate. The Transport Layer sends data to the Internet layer when transmitting and sends data to the Application Layer when receiving. Following template will be used for each parameter. Internet Layer: The Internet Layer provides connection-less communication across one or more networks, a global logical addressing scheme and Packetization of data. The Internet Layer is concerned with network to network communication. (Note: Packetization is act or process of bundling data into packets according to a specific protocol)The Internet Layer is responsible for Packetization, addressing and routing of data on the network. Internet Protocol provides the Packetization, logical addressing and routing functions that forward packets from one computer to another. The Internet Layer communicates with the Transport Layer when receiving and sends data to the Network Access Layer when transmitting. Network Access Layer: The Network Access Layer provides access to the physical network. This is your network interface card. 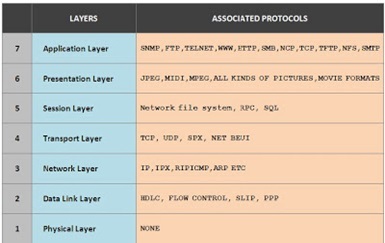 Ethernet, FDDI, Token Ring, ATM, OC, HSSI, or even Wi-Fiis all examples of network interfaces. The purpose of a network interface is to allow your computer to access the wire, wireless or fiber optic network infrastructure and send data to other computers. The Network Access Layer transmits data on the physical network when sending and transmits data to the Internet Layer when receiving. The Application layer provides services to the software through which the user requests network services. Your computer application software is not on the Application layer. This layer isn’t about applications and doesn’t contain any applications. In other words, programs such as Microsoft Word or Corel are not at this layer, but browsers, FTP clients, and mail clients etc. File Transfer Protocol (FTP): A protocol that enables a client to send and receive complete files from a server. Hypertext Transfer Protocol (HTTP): The core protocol of the World Wide Web. Telnet: The protocol that lets you connect to another computer on the Internet in a terminal emulation mode. Simple Mail Transfer Protocol (SMTP):One of several key protocols that are used to provide e-mail services. Domain Name System (DNS): The protocol that allows you to refer to other host computers by using names rather than numbers. This layer is concerned with data representation and code formatting. Encodes and decodes data; Encrypts and decrypts data; Compresses and decompresses data. The Session layer establishes, maintains, and manages the communication session between computers. Manages user sessions and dialogues. Controls establishment and termination of logic links between users. Provides connectionless oriented packet delivery. Transmission Control Protocol (TCP): Provides reliable connection-oriented transmission between two hosts. TCP establishes a session between hosts, and then ensures delivery of packets between the hosts. User Datagram Protocol (UDP): Provides connectionless, unreliable, one-to-one or one-to-many delivery. Determines how data are transferred between network devices. Routes packets according to unique network device addresses. Provides flow and congestion control to prevent network resource depletion. The Network layer is where data is addressed, packaged, and routed among networks. Internet Protocol (IP): A routable protocol that uses IP addresses to deliver packets to network devices. IP is an intentionally unreliable protocol, so it doesn’t guarantee delivery of information. Address Resolution Protocol (ARP): Resolves IP addresses to hardware MAC addresses, which uniquely identify hardware devices. Internet Control Message Protocol (ICMP): Sends and receives diagnostic messages. ICMP is the basis of the ubiquitous ping command. Internet Group Management Protocol (IGMP): Used to multicast messages to multiple IP addresses at once. As its name suggests, this layer is concerned with the linkages and mechanisms used to move data about the network, including the topology, such as Ethernet or Token Ring, and deals with the ways in which data is reliably transmitted. Defines procedures for operating the communication links. Detects and corrects packets transmit errors. The Physical layer’s name says it all. This layer defines the electrical and physical specifications for the networking media that carry the data bits across a network. Defines optical, electrical and mechanical characteristics.